Our Sheriff's Explorer Program has created a volunteer partnership between youths in our community and law enforcement. The explorers, between 14 and 21 years of age, receive extensive training in an academy setting. They then participate in community affairs and non-hazardous law enforcement activities. The explorer program is great for those youth considering a future career in law enforcement or those who just want to get involved and help out. If you are interested in working as a Sheriff's Explorer, please apply below. The Law Enforcement Explorer Program is a Sheriff's Department youth oriented program affiliated with the offices of the Boy Scouts of America (BSA) and Learning for Life. Its primary purpose is to provide, through actual experience, a means by which young men and women may determine if they would like to pursue a career in law enforcement. Secondly, the program also provides the Sheriff's Department with additional human resources and it opens an important avenue of understanding with an energetic, concerned society of young people. To qualify for the position of Deputy Explorer you must be between the ages of 14 and 21 years, have completed the eighth grade, have at least a “C” average if in high school, be of good moral character, and have no serious arrests or convictions. In addition Deputy Explorers must meet the same basic physical requirements as a Deputy Sheriff. What Do Deputy Explorers Do? Deputy Explorers assist Regular Deputy Sheriffs by performing non-hazardous duties such as report writing, special events, public fingerprinting, assist in "Operation Kid Print," crowd assistance at parades and civic events, anti-crime campaigns, search missions, and statistical computations. Deputy Explorers usually work at the Sheriff s Station closest to their homes. Special assignments, such as parades, air shows, conferences, and expositions, will sometimes require that an Explorer travel to other parts of the County. Deputy Explorers are non-compensated but completely insured while in training and on duty. New members are expected to furnish their own uniforms and equipment upon acceptance into the program. What Training Do Deputy Explorers Receive? After acceptance into the Program, initial training for new Deputy Explorers takes place at one of the Sheriff's Department Explorer Academies. They are located at the Sheriff’s Training Academy and Regional Services Center (STARS) in Whittier, the Santa Clarita Community College in Santa Clarita, and the Lancaster Sheriff’s Station in Lancaster. The Explorer Academy consists of approximately 184 hours of instruction during 18 weeks of training on Saturdays. Subjects such as community relations, criminal law, demeanor, firearms safety, narcotics control, police procedures and weaponless defense must be mastered. The trainees are required to undergo drill and physical training as well as their classroom work. Satisfactory completion of the Academy may earn the Deputy Explorer high school or college unit credits. If you decide you want to become a Law Enforcement Explorer, and you feel that you meet the minimum qualifications, please pick up an Explorer application at the Palmdale Sheriff's Station lobby at 750 East Avenue Q, Palmdale. After you have completed the application, submit it to the Palmdale Sheriff's Station lobby. You need not live in an area policed entirely by the Sheriff's Department to become a member of the Explorer Program. You may also obtain further information about the Program by contacting the Department’s Reserve Forces Bureau at (562) 946-7871. We invite you to call if you are uncertain about any aspects of the Program. Discuss the Law Enforcement Explorer Program with your friends and family. Make a decision today, explore law enforcement, and provide vital services to your community. 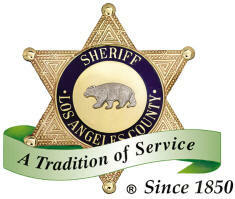 Visit the official LASD Explorer Program for more information.